In East Lansing, Michigan, Matt Ottinger is "the game show guy," and not just because he hosts a local PBS quiz show. In 2004, he became the Guy Who Nearly Beat Ken Jennings. As Ottinger recalls: "We were in the Sony parking lot being introduced to each other and we heard them say, 'And this is the returning champ, Ken Jennings, who has won 13 games.' At this point, we had see Tom Walsh win seven games, but nobody had seen 13. I'd have rather played somebody who had just fluked into a win!" The game itself proved very close and the tide only began to turn late in the game. "I called the Katzenjammer Kids the Katzenheimer Kids, and that was a $2000 clue. So I was down $2000 instead of up $2000, and then Ken got it, so it was a $6000 swing." Worse, the categories that followed did not play to his strength. However, Ottinger doesn't like to dwell on that. "People come up to me and say, 'If you hadn't played Ken Jennings, you would've gone far.' And it's true that everyone likes to explain away why they lost. But it helped me to get over the disappointment to realize that everyone feels that way, even the ones who did very well. So now, I tell people that I had fun and that's all there is to it." His quiz show hosting, however, did help him take on Ken. "I would have been weaker on academic side, if I hadn't been questions about academic subjects for as long as I had." That show, Quizbusters, is now in its 16th season on WKAR, where he commands respectable local ratings. The station had run a high school quiz bowl in the 1970s, and when Ottinger heard that they wanted to revive it, he applied to be the host. 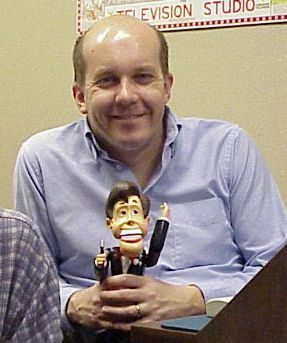 Quizbusters itself is largely modelled on the quiz bowl format, although Ottinger was inspired by Canada's Reach for the Top, which reached Michigan, and Sale of the Century, on which he had appeared. “I was on Sale of the Century in 1986 and I did really well at the start. But I ended up losing to a champion who went on to win the grand prize," says Ottinger. "It was eerily similar to my Jeopardy experience. It was exhilarating, disappointing and most of all, it was fun." In addition to his on-air work, Ottinger works at a local school, teaching kids about telecommunications technology. But he also is also a game show historian with a large videotape collection of classic television game shows dating back to the 1940s. He also collects game show memorabilia and has one of the largest collections of game show box and board games in the country. Indeed, having made a memorable mark on two game shows and hosted a show of his own that has lasted for a generation, Ottinger has become a small part of game show history himself.